HAYWARD PRO SERIES S180T93S Above Ground Swimming Pool Sand Filter + 1.5 Pump. 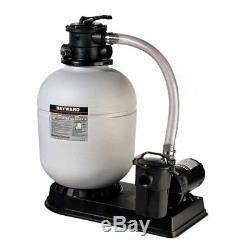 New Hayward Pro S180T Above Ground Swimming Pool Sand Filter 18 Tank, 1.5 hp Pump and Valve. For Larger Above Ground Pools. System for larger aboveground pools. Exclusive full flow 360Â° self cleaning laterals provide energy efficient operation and thorough back washing. We are an Authorized Hayward Dealer! Superior filtration from the inside out. The Pro Series filter features an integral top diffuser that evenly distributes unfiltered water over the sand media bed in a cascading, umbrella like pattern. This allows the greatest filtration possible from every square inch of sand. Then the self cleaning underdrain assembly, with its 360Â° slotted laterals, provides a fast, balanced flow of clear water back to the pool while allowing for more thorough backwashing. Best of all, the Pro's full flow technology reduces your energy costs because the filter operates for shorter periods. Seven position valve puts you in control. The patented, multiport control valve developed by Hayward was designed with seven pool filter positions. An easy to use lever action handle lets you quickly dial any function. You can easily access the Pro Series filter assembly for simple servicing via the unique folding ball joint in the laterals. A corrosion proof housing protects the filter from severe weather for years to come. Seven position Vari Flo control valve makes changing filter function quick and easy. Easy access assembly makes service simple. Filter Type: High rate sand: No. 20 silica sand (0.45mm 0.55mm). Underdrain: 360 degrees self cleaning slotted laterals, precision installed in ball joint assembly. Control Valve: Seven position, top mount Vari Flo valve with lever action handle. Valve Fastening: Flange clapmp design. Pump and Motor: PowerFlo Matrix Series Pump 115 volts. Mounting Base: Injection molded thermoplastic. Effective Filtration Rate: 1.75 sq. Design Flow Rate: 35 GPM. 8 Hours 16,800 Gallons. 12 Hours 25,200 Gallons. 50 PSI Max Working Pressure. Ve been helping pool owners enjoy the pleasures of pool ownership by manufacturing cutting edge, technologically advanced pool equipment worldwide. We strive to ensure that your Totally Haywardâ? ¢ System operates at maximum efficiency all season long. Our goal is that at the end of the day, your only concern is to turn your equipment on and off. Whether you are trying to create the perfect backyard environment, reduce operating and maintenance costs through the ease of wireless controls, Hayward is your single source solution. Our products include a complete line of technologically advanced pumps, filters, heaters, heat pumps, automatic pool cleaners, lighting, controls and salt chlorine generatorsâ?? High-quality components engineered to work together to keep your pool at its best. Hayward aims to take the worry out of pool ownership by developing products that are efficient, require little maintenance and add value to your investment. Cancelling Your Order: Your order is important to us and will be processed immediately. Select the reason for the return. This listing is currently undergoing maintenance, we apologise for any inconvenience caused. The item "HAYWARD PRO SERIES S180T93S Above Ground Swimming Pool Sand Filter + 1.5 Pump" is in sale since Thursday, January 3, 2019. This item is in the category "Home & Garden\Yard, Garden & Outdoor Living\Pools & Spas\Pool Equipment & Parts\Pool Filters".